This advice genuinely changed the way I view everything that I do. But taken too literally it can make for a very unhappy life, or in retail and restaurant groups, very unhappy store managers. That is why it is a slightly modified version of this approach that I would like to pass onto anyone looking to start benchmarking location performance in a retail chain, franchise or restaurant group. Why Benchmarking CX Performance is Important? Benchmarking store performance in terms of customer experience is critically important in multi-location businesses. 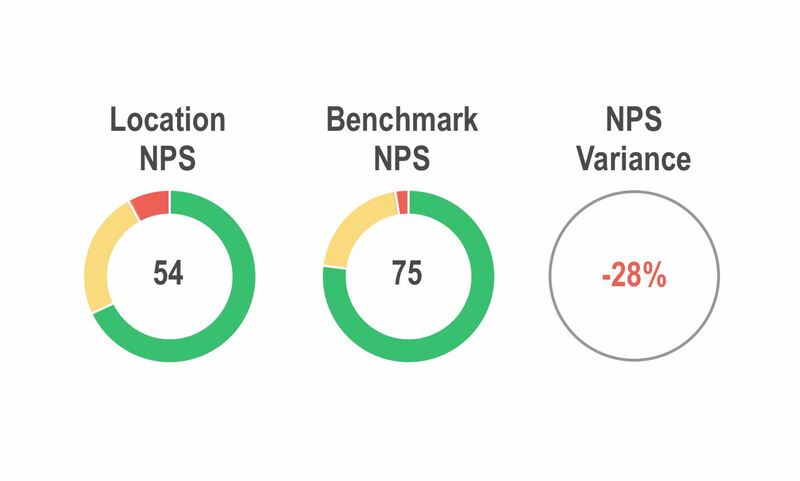 For the purposes of this article we are going to focus on Net Promoter Score (NPS) benchmarking, but the same principles apply no matter what CX metric you are using. On one hand benchmarking unit performance helps you protect market share and on the other it helps you grow market share. One poorly performing location can do untold damage to your brand and therefore the rest of the chain. It may be a one-off catastrophic event that is amplified by social media (e.g. the infamous taco licking scandal below). Or it might be more akin to death by a thousand cuts if the restaurant is gradually turning customers off the brand one by one. Either way, instead of that location building the reputation of the brand and spreading its sphere of influence, the store is stunting the chain’s growth on either a local or national level. NPS benchmarking will help you identify those stores that are performing badly early, which means you can take action. Without it you are waiting for financial results or worse, social media, to tell you there is a problem in a particular location. Identifying the top performing locations from a CX point of view and matching them with a list of the best financial performers is a very useful exercise. It is normal to see a strong correlation between the two. Modelling processes and best practices on the stores that rank highly on both lists will help you improve the entire chain's performance in terms of both customer advocacy and financial performance. Just like a sales manager will ask her most successful salespeople to share their tactics, operations managers should be sharing how top performing stores are wowing customers. There is no quicker way to build market share than to have people telling their friends and family that they should pay a visit. While it’s always important, benchmarking CX performance is absolutely critical in the early stages of expansion when the brand is still nascent. Benchmarking against the average performance breeds mediocrity. Using the average means underperformers are not put under any significant pressure, while there is little incentive for average performers to improve. At the same time, top performers may get lax because they are so far ahead of the curve. You can see where that is going to end up! Benchmarking against the top location or even the top 5% can do more damage than good in the long run. Winning is good for the morale of any team, so you want as many winning managers as possible. At the same time, you want to design a system that pulls standards upwards. Creating a situation where there’s only one winner or no expectation of being able to become a winner, can reduce the enthusiasm for achieving CX improvements. That can lead to apathy, which is the true enemy of customer experience management. On top of that, external forces that influence CX results, such as the demographics of the customer base, are out of the control of the manager/franchisee. This means two equally excellent managers can have slightly different results. Frustration may kick in if such a quality operator is not perceived to be better than the benchmark. Using the average of the top quartile of locations creates a mini-league among your leading operators, while giving the average operator an achievable target. By choosing this benchmark you have created two separate competitions. The first is to be the best of the best within the top quartile. The second is to break into that elite group and leave the ordinary 75% behind you. Backed up with bonus structures and rewards, a system like this will be engaging and motivational for far more players than a winner takes all approach. That should naturally lead to an upswing in NPS or whatever other metrics you’re using to track CX. In a future blog post we will cover what the features of a strong location benchmarking system look like. NPS benchmarking or benchmarking on any other metric is not rocket science. But to maximise the benefit of your benchmarking programme requires it to be set up correctly at the outset and then actively managed on an ongoing basis. To do it well you will need some sort of software to capture customer feedback, compile the results and then communicate them with your managers and/or franchisees. There are lots of options out there, but unlike ServiceDock, few are built from the ground up for multi-location businesses and none use messaging apps to capture customer feedback. If we can be of any assistance to you, please get in touch.